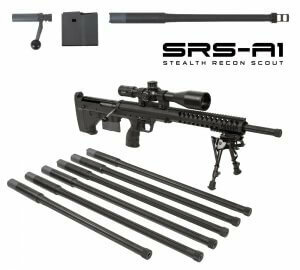 The SRS A1 and Covert both have many caliber conversion kit options including aftermarket custom options. As do the HTI and MDR. Conversion kits should be cared for much like a rifle. Avoid any damage to the barrel shank, barrel extension, and the muzzle. These areas are crucial to proper function of the rifle, and even small deformations or dings could affect your ability to mount the conversion kit in the chassis. It is best to keep conversion kits in a case or other protective sleeve. Owners should also ensure to keep conversion kits from becoming mismatched, mixing of barrels, bolts, or magazines could cause a catastrophic mistake such as chambering incorrect cartridges.